Display WooCommerce products by customer's user role. This plugin is a premium version of free "Product Visibility by User Role for WooCommerce" plugin. 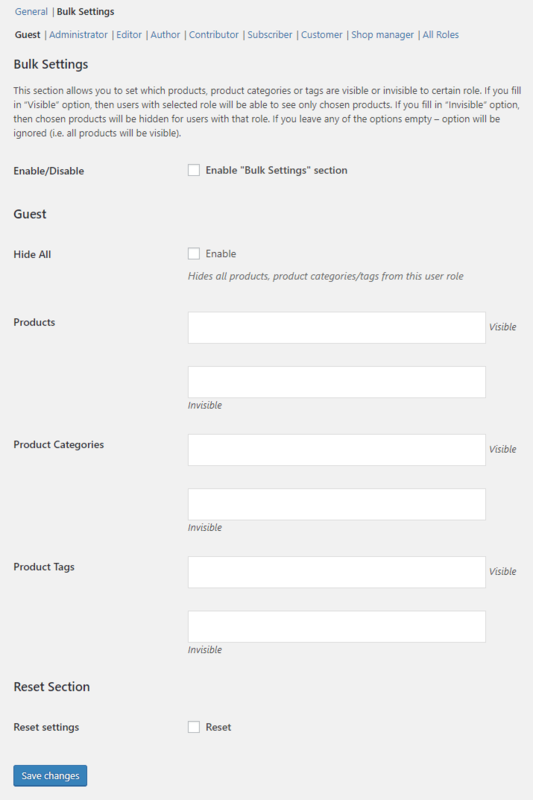 Product Visibility by User Role for WooCommerce Pro plugin lets you show/hide WooCommerce products depending on customer’s user role. Plugin settings are located in “WooCommerce > Settings > Product Visibility”. Also to set user roles for each product, check “Product visibility” meta box on each product’s edit page. This will hide selected products in shop and search results. However, the product will still be accessible via direct link. This will make selected products non-purchasable (i.e. product can’t be added to the cart). This will hide selected products completely (including direct link). Hides nav menu items (i.e. hidden products, product categories and tags). Only products, product categories/tags marked in bulk settings will be hidden. This options uses the wp_get_nav_menu_items filter. Hides products categories and tags from being displayed on front-end. Only categories/tags marked in bulk settings will be hidden. This options works filtering terms from get_terms() function. This option is useful only if Modify query is enabled. Redirects to a page different from 404, in case a product is considered invisible. This will add new “Product visibility: Redirect URL” meta box to each product’s edit page. This will replace the content in the “Description” tab for the selected products. Leave blank to show all available user roles. This will add “User Roles” column to the admin products list. This will add “User Roles” options to the product quick edit screen. This will add “User Roles” options to the products bulk edit screen. Pro version also allows you to set user roles visibility options in bulk (for multiple products at once, product categories or product tags). 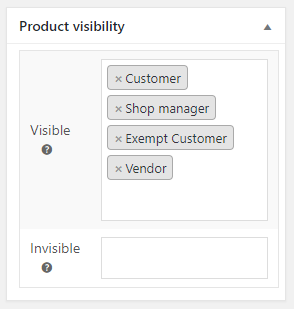 In “WooCommerce > Settings > Product Visibility by User Role > Bulk Settings” you can set which products, product categories or tags are visible or invisible to certain role. If you fill in “Visible” option, then users with selected role will be able to see only chosen products. If you fill in “Invisible” option, then chosen products will be hidden for users with that role. If you leave any of the options empty – option will be ignored (i.e. all products will be visible). Q. I have a pagination issue: the number of products on each page turns out random depending on which products are hidden. What should I do? A. You need to enable “Modify query” checkbox in plugin “General” settings section (in “WooCommerce > Settings > Product Visibility”). Great plugin works well. really fast support – Author even modified plugin for a new feature request. Highly recommended. Support for this plugin was excellent from Pablo, Thanks for your support Pablo. Let me start out to say, Pablo is hands down awesome! His customer service skills and expertise with woocommerce are incredible. I can to him with a problem that I was seeing using this plugin, and he helped fix the problem immediately. I cannot say enough good things about him. Very sincere, and will definitely make sure you are happy with the plugin you purchase. 110 thoughts on "Product Visibility by User Role for WooCommerce"
Is there any way to redirect user to another link if they can’t access to product ?? Not to 404 NOT FOUND page. We just added a new option on admin called “Redirect”. It allows you to redirect to a page different from 404, in case a product is considered invisible. Instead of this admin option, you can use the filter ‘pvbur_invisible_product_redirect’ instead. is it correct that plugin just hide products but not categories and menu if it associated with the product? any chance for update with this feature? Did you try enabling “Modify query” checkbox in plugin settings? Could you please let me know if those empty categories and menus are shown in your theme without our “Product Visibility by User Role” plugin. I mean – if our plugin is disabled at all, and you create an empty category – is it still shown or hidden? i have 7 categories with product on of them milk and if i am showing just milk for one client the other categories are empty but they still appear in categories list and menus. Can you please send us your site URL? I’m happy to inform we just updated a new version (1.1.7) which allows you to hide empty categories. You just have to enable the option called “Hide menu items” on plugin’s settings. After that you have to save the menu. This option still does not hide “empty” categories from the menu. Do you have a solution for this? If anyone else has the same issue – as we’ve figured out in private emails – “Hide menu items” checkbox hides *menus* (i.e. from “Appearance > Menus”) and in this case it was a list of terms rather than a menu. After checking “Hide products terms” checkbox in plugin’s settings the issue disappeared. I’m using the “Members” plugin to create custom roles. Will the Pro version of this plugin recognize custom roles, or just the WordPress default roles? Does the plugin work on variable products? Can we hide only some variation of same product? Also Im wondering how does bulk function work. In admin product list table? The Bulk settings are located on plugin’s settings, next to General tab. Hello, any updates about variable products support? I installed your plugin – everything works fine. Allmost everything. When I enable “Modify query”, I get a 404 error when trying to open the “my account” page; when I disable this option, everything is fine… in addition, the problem does not affect guest-user, but for example customer-users. Can you please update to the most recent version (1.1.8)? I used the plugin for example to hide all products to guests – now, as a guest, you suddenly see all products… perhaps something is wrong with that version? Can you please try one thing? Just enter on the admin page of a product that should be invisible and try to simply update it. Unfortunately, this did not change anything. The Problem only occurs if I am trying to toggle visibilty using tags. When I am using the setting “invisible for Guest” on the product edit page, the product gets hidden – so this setting works fine. I just uploaded a new version. Can you please check it out? On my site Weensu.dk I have used your plugin cause I want to show certain products to vendors only (also admin and shop manager) and hide for customers, since they are not “real” products. The idea with your plugin is great but I am still seeing the products on shop page if I sort on filter “newly added” or search for the product in search field. Is this an error you know of? My guess is that the idea is to completely hide the products that have been marked as visible to only certain user roles. I have clicked all 3 settings in admin area regarding when and how to hide. That shouldn’t be happening. Are you using the most recent version ? What do you need to see my site? Can you please create a WordPress user for me using the email [email protected]? I have set it up so that Vendors should see the specific products and customers should not. What user role do you want? I have added Products bulk edit and it still doesn’t show on the bulk edit screen?? Also, I set up in the Bulk Edut section that for “Guest” my default category is set to invisiable, but it still shows?? I’m fixing some issues on the plugin. It should be available soon. where can I find the 1.1.7 version?? He have already fixed all the issues since version 1.2.0. Are you still facing some kind of problem? Just purchased Product Visibility by User Role for WooCommerce Pro but get the following error. I know we have already fixed this for you but just to make it clear for other users, this error have been fixed on version 1.2.0. Hi, just installed the pro plugin. I used “visible categories” for a certain profile. The problem: unavailable products are white spots on my shop page, they are not really hidden. Can you please make sure the “Modify query” option is checked? Can we hide only some variation of same product based on a role? Unfortunately that’s not possible for now. 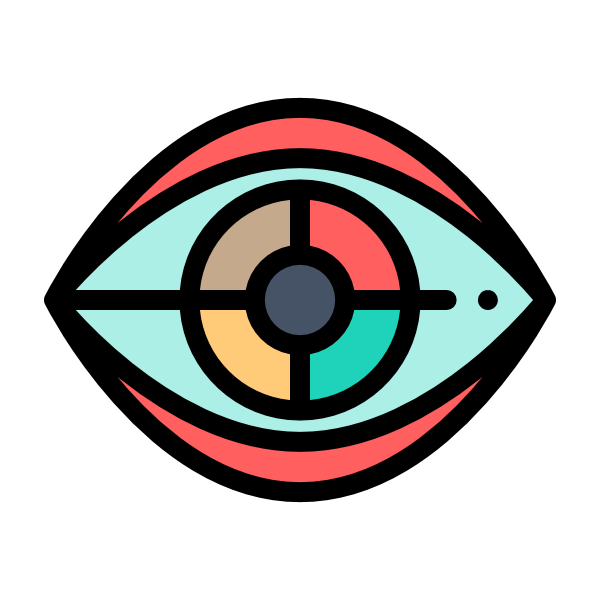 Hello – The plugin works great to hide products from users with the Guest user role. However, products are still showing up in Guest searches. No combination of check marks in the settings fixes that problem. Can you please advise? Can you please describe exactly what settings are making your products be displayed in search results? “Modify query” is checked. “Admin products list column” is checked. “Product quick edit” is checked. I tried on a sample product, and it shows 404 for Guests with a direct link (which is correct). But then, as a Guest, I searched for the product, and it shows up in Search results. I noticed you were right. I just updated the plugin. Can you please try it and tell me the results? Ik just downloaden and tested the free version. But i also have the same issue as Eva. Product is hidden and is not accessible. But it shows in the search result. Can you please make sure to disable your free version before trying to enable the pro one? DOn’t worry – I just realised i had the non pro version installed as well and it was causing a conflict! I’ve create a staging environment were you can check the bbpress issue with the activated plugin. Can you please leave me an email adres so I can setup an administator account for you. Found your email adres, have sent you all the details. Checking the modify query option breaks the main menu on Divi theme, it looks like the menu displays as if no menu was configured i,e adds all pages to menu. Is there a way to stop this happening? Can you please check the most recent version (1.2.4)? I believe you’ll have no menu issues with this version. Please give it a try and tell me if you need any help. I’m using the pro version. I’m using first level categories to separate sub-categories which different User roles can see. When on the shop page, it shows the main category, how can i display the sub category list by default? Also how can i make all Sub categories of parent category visible? Cause I have like 10 main categories which are different, but there are 4-8 sub categories which have the same name, and in the Bulk editor, the categories are all the same and i see 10x the same name and i am unable to tell which one is the right sub-category. Can you please try to use product tags to control your product visibility? Maybe it will help you considering your situation. Please try it and let me know if you need more help. Client has items in retail that they don’t want dealers to order and they have dealer items they don’t want retail customers and/or guests to see. Ideally, the dealer logs in and they see only the dealer items (that is to say, retail items are excluded once the dealer logs in). (2) Retail/Guest SKUs are hidden from dealer view once logged in. Please advise whether your plugin allows for this, thanks! I think it will work fine for you. But anyway, you can buy it and if it doesn’t work well you can ask for refundment. I’m setting up a website, hiding and showing categories to certain user roles. It was working fine, but we needed two roles for every user: one inluded in rules of this plugin, the other to be seen by antoher plugin. If I set the second role to an user (with “user role editor” plugin) that user keeps the same visibility of the products, but he sees all categories in the widget category menu. Of course, clicking the categories nothing is found, but we need to hide the catergories entries, too. no answer? where is the support? Can you please contact us using this form? can I disable the redirect by seeing the product page? because currently when I try to enter into a product that I have set as not visible (main category) I can not view it but redirects me to a page 404. Can you please try to uncheck the “Modify query” option? can this plugin be used on this? The visibility options are related to frontend only, not admin. But if you want I can develop a new option where products can be invisible even on admin. However according to your example, if Roy changes his product to category B by accident and save it, he will not be able to see it anymore. Can I discuss with you more closely? or can it be inputted to your contact, maybe email or whatsapp? Please use our contact form at Contact Us page. How can I hide the message: “Sorry, but this content can only be displayed with sufficient permission.”. It is displayed to guest users. For guest users, only some items are visible. I’m sorry, I think I didn’t get exactly your question. You simply want to hide the message or do you think some items are incorrectly visible? Is there a way to make product visible for user only instead of user role? If not, do you have another plugin that does this? I would like to make some products visible but non-purchasable for guest but purchasable for some roles like suppliers. I have checked the box in the general settings but when I want I go into bulk settings or in a product I canot see anywhere to apply the non-purchasable product. Can you explain me what are the correct steps please ? I think you’ve found a little glitch. Thanks for letting me know. I believe I was able to fix it on version 1.2.6. Can you please try it? If you check the “Make non-purchasable” option you have to let the “Modify Query” option disabled. Thank you for your answer. I have updated the plugin and everything that could be updated and followed your explanation. Then I went to see if I could use the bulk settings select non-purchasable for pruduct, tags, categorie, etc. in the same way as visible/invisible. I did not see any non-purchasable option there. Then I went into a product so see if the visibility options of wordpress or visibility option of the plugin offered me a choice of selecting the product as non-purchasable. I did not see anything there either. Can you check the update or explain me where I can apply the non-purchasable option ? Thank you for help. It works fine now. Hi there, plugin is working great however I have run into a problem with our setup. We have multiple user roles applied to users. One user role allows cash on delivery, and another is ‘gold member’. However some gold members also have the role of ‘cash on delivery’ and we want them to still see hidden products. Other ‘Normal customers’ have role ‘cash on delivery’ but not gold member so we dont want them to see the hidden products. Problem is if a user is both Gold member + cash on delivery then they cant see the hidden products. Hello, I’m really happy with your “Country Product Visibility for WooCommerce Pro” plug-in, just missing one thing because it’s perfect (for me)… adding the possibility to hide an entire category as well. If it does not even appear in the category widgets (the category does not appear in the list) .. it would be great !!! I would be very grateful if you could add this functionality to your plugin which is essential to me. Same thing happens to us, the option is enabled in general and the entire category should be invisible for the user role but only the products are invisible, the category is still in the menu. Product looks good (I’m in testing fase), but doesn’t seem to work with WPML. Only works on main language. Is it compatible with WPML? We’ve just released new plugin version (v1.2.3 for free and v1.2.7 for Pro), where WPML issues should be fixed. Could you please take a look and let me know if something is still not working as expected. Hello before i buy this plugin there is option to do the visible produce per user and not per role ? I answered here some hour ago, but now I can’t see my post. Could you please update to v1.2.9 and let me know if it fixes it? I did, it works! Great help and support! Happy to hear it’s fixed! P.S. If you like the plugin, please leave us a rating. I just purchased and was hoping that i could control the url redirect per product. It seems as there is only 1 place for the redirect. Any chance that there is a way to control the redirect url per individual product? If anyone else has similar task – “Redirect URL per product” option is available in Pro since version 1.3.0. We just purchased this plugin. What we would like to do is hide all products for every role through the Bulk Settings area. 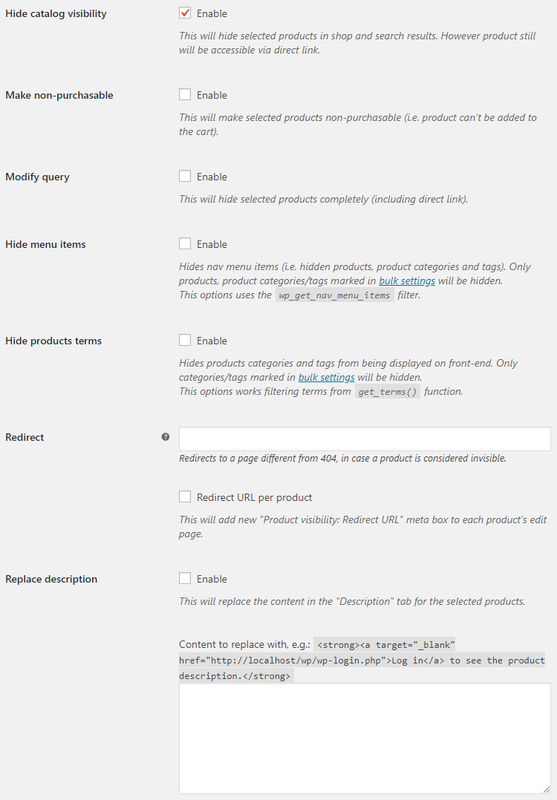 Then, using the Product Visibility on the Edit Product page, we would like to select which roles can view that product. We would like to be able to see all of those products that are selected as viewable in the Bulk Settings area when viewing the selected role. The problem is that on the Bulk Settings area, when we select a role and check ‘Hide All’, the front end returns the error “Warning: count(): Parameter must be an array or an object that implements Countable in /home/baseline/public_html/profillment/wp-includes/post-template.php on line 284”. When it is off and we add products to the Products Visible area, only the products in the box show. This is great! However, the setup here does not show when editing a product. This inconsistency makes it confusing to manage which products are visible to which roles. So while this Bulk Settings may be advantageous during setup, it is counter-intuitive when managing products. When using ‘non-purchasable’ option, the ‘add to cart’ button disappears on the single product page, which is correct. However, if you go to a category page, the products are not there despite the sorting toolbar showing “Showing all 2 results”. Are you aware of the issue? This plugin has begun affecting all posts / pages on my site, for example when I have a role restricted by product tag, the user is unable to access the cart/checkout pages on the site. A 404 error is displayed. The error only seems to occur when modify query is enabled. Maybe you can create/share an admin account to your server (WP and FTP), so I could log in and check what’s going on. If that’s possible – my private email is [email protected]. If sharing an account is not an option – please let me know and I will try to solve this remotely, and in that case please copy/paste and send to me all the info from “WooCommerce > System Status” page. I have emailed you all the details as well as a screen recording of the issue. I’m using this plugin with different user roles. Everything works fine, except the first shop page. Every page should show 16 products, but the first page shows only 3 or 4 and the page numbers are too many, the last shop pages are all empty. If I go to the second shop page everything looks fine again and the shop pages are reduced correctly. Do you know how I can fix the first page? Please try enabling “Modify query” checkbox in plugin “General” settings section (in “WooCommerce > Settings > Product Visibility”). 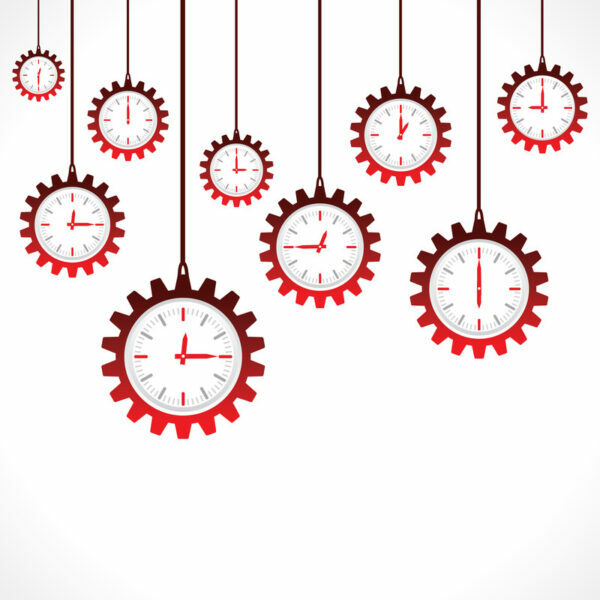 Do you know if you pro plug-in works with following Wholesale order form? Free version of your plug-in hides products from regular woocommerce shop page but it does not hide product from this wholesale order form. I am planning to use this plugin to create a wholesale shop to bulk hide the existing (retail) products from the Wholesaler Role and add new wholesale products visible only to them. My question is: can I bulk hide the products from the Products page bulk editor, by ticking them and bulk edit them? I have 1200 products and I will certainly not be able to enter every single one of them in the Bulk Settings’ textarea, under Woocommerce Tabs. The Product Category visibility by User role is working fine, but none of the static pages are accessible now, they keep getting re-directed to the 404 error page, even the Woocommerce myaccounts page. I want only the Product categories in the Visible field to be accessible to the role, the rest shouldn’t but when I type the URL of the other Categories, it displays it, I have around 200 product categories and I cannot enter each one of them for every role in the invisible field. Please provide a solution to both the issues above ASAP, we are in launching in 2 days. Woocommerce version is 3.5.3 and there are NO compatibility issues, as I have tried switching it off for 1 role only and the static pages start working. The enabling of the Modify Query fixes the pagination, but non-admin users are directed to 404 Page when they click on any static page? Please point out what is wrong here, we need to launch tomorrow. * Dev - Plugin author data updated. * Dev - General Options - "Replace description" options added. * Dev - Admin Options - Product quick/bulk edit - "Clear" option added. * Dev - Bulk Settings - Products - Language codes added to the list. * Dev - Major code refactoring. * Dev - Admin settings restyled. * Dev - Admin Options - "User roles to display in settings" option added. * Dev - Admin settings descriptions updated and restyled. * Fix singular view if category option is in use on bulk settings. * Fix duplicate tax_query parameters. * Improve nested tax_query parameters by making it simpler. * "Redirect URL per product" option added. * Bulk Settings - "array_merge(): Argument #1 is not an array" PHP warning fixed. * "Hide menu items" now also hides products items from menu (i.e. not only categories and tags). 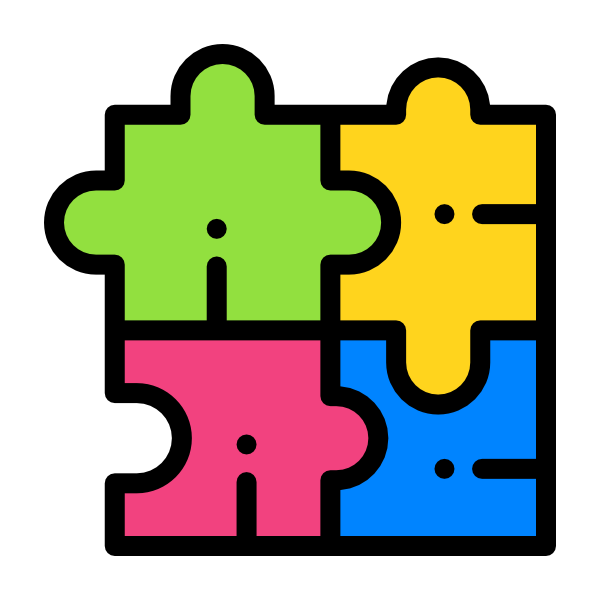 * Add WPML compatibility to bulk section. * Code refactored (admin settings). * Fix products terms hiding regarding multiple roles. * Fix redirect option forcing invisible products to be 404. * Make the plugin compatible with WPML plugin. * Dev - Bulk Settings - Products - Product ID added to listing. * Dev - Bulk Settings - Products - WPML - Listing all languages products now. * Dev - Bulk Settings - Products - Code refactoring - Variations listing optimized. * Dev - Bulk Settings - Categories / Tags - WPML - Listing all languages terms now. * Dev - Bulk Settings - Categories / Tags - Term ID and term parent info added. * Dev - Plugin URI updated. * Improve 'Bulk Settings' code combined with 'Modify Query' option. * Add compatibility with WPML plugin. * Improve 'alg_wc_pvbur_can_search' filter preventing the main visibility query to work on wp menu. * Fix category visibility replacing 'key' by 'taxonomy' on tax_query parameters. * Allow other plugins to interact with invisible products query using the 'alg_wc_pvbur_can_search' filter or passing a 'alg_wc_pvbur_search' parameter on customs WP_Query queries. * Add WooCommerce minimum requirement. * Improve performance of invisible products search by saving the results of alg_wc_pvbur_get_invisible_products() in cache (Only the ids, not WP_Query). * Add action 'alg_wc_pvbur_save_metabox' on metabox saving. * Add new function 'alg_wc_pvbur_get_invisible_products_ids()' to get only the invisible products ids, with a cache option. * Improve 'alg_wc_pvbur_is_visible()' function. Get the terms isn't working properly. Replace by wp_get_post_terms(). * Add is_search() check to products hiding function to make sure it works on search results too. * Add new option to filter product terms hiding product categories and tags using the get_terms() function. * Improve invisible product detection on single product pages. * Add new option to hide all products, product categories/tags from user roles. * Change the way Modify query option works. * Update WooCommerce tested up to. * Remove pro version checking. * Fix visible products logic. * Fix 'alg_wc_pvbur_get_user_roles()' function exists. * Use composer to handle dependencies. * Sync bulk options with post meta values. * Change the way "product_by_user_role_pre_get_posts()" works. Now it really hides invisible product from queries fixing issues with pagination. * Add action 'pvbur_save_product' after a product is updated. * Add a new admin option to hide categories from wp nav menu if there is no products to show. * Add a filter 'pvbur_hide_empty_cats' to hide categories from wp nav menu if there is no products to show. * Add new option on admin to redirect to a page different from 404 in case a product is invisible. * Add new filter 'pvbur_invisible_product_redirect' to redirect to a page different from 404 in case a product is invisible. * Fix - Core - is_visible() - Bulk settings - Products - Returning false only. * Dev - General - Admin Options - "Product quick edit" option added. * Dev - General - Admin Options - "Products bulk edit" option added. * Dev - Core - Possible "wp_get_current_user() undefined" error fixed. * Dev - Admin Settings - Settings tab title updated. * Dev - Admin Settings - General - Description updated. * Dev - Admin Settings - Bulk Settings - User roles subsections added. * Dev - Admin Settings - Meta box - Title updated. * Dev - Admin Settings - Bulk Settings - "Save all changes" button added to each role's section. * Dev - Admin Settings - Meta box - Title and descriptions updated. * Dev - "Bulk Settings" section added. * Dev - Admin Settings - Meta box select - chosen_select class added. * Dev - Admin Settings - Meta box on product edit moved to side with low priority. * Dev - Code refactoring. * Dev - Saving settings array as main class property.